Peel and cut sweet potatoes into approx. 5-cm/2-inch. chunks, much like you would when making mashed potatoes. Add sweet potatoes to a large pot and cover with water. Add the butter. Bring to a boil over medium-high heat for approx. 20 – 30 min. (time depends on size of chunks). They are done when you can easily stick a fork through them. Don't overcook. Drain about three quarters of the water from your pot and return to stove. Add peanut butter, maple syrup, vanilla extract, and brown sugar to pot. Stir until mixed well. Turn heat down to low. If it seems a bit runny, add some more peanut butter to help thicken it (you may also want to add a little more maple syrup to taste). Add mini marshmallows to cover top of the pot and turn off heat after a few minutes. Once marshmallows have melted a bit, they are ready to serve. 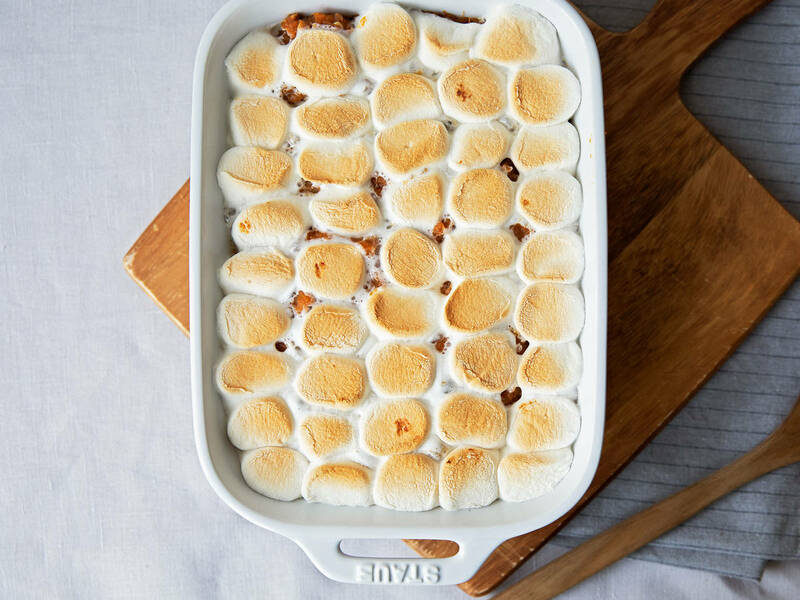 Alternatively, transfer sweet potatoes to a baking tray, top with mini marshmallows, and transfer to a preheated oven at 200°C/400°F, and bake for approx. 10 min., or until marshmallows are browned. Enjoy!